Listen to a sample of this vocal song track. Listen to a sample of this instrumental song track. 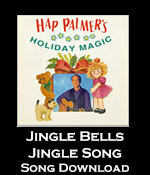 Hap Palmer's Jingle Bells – Jingle Song is available in lead melody sheets with chords in both the key of ‘D’ and ‘E’. This song is also available on Hap Palmer's Holiday Magic.